The Winchester Supreme Elite Bonded PDX1, which was chosen by the FBI as their primary service round, is available in a full line of popular handgun calibers. The Bonded PDX1 is engineered to maximize terminal ballistics, as defined by the demanding FBI test protocol, which simulates real-world threats. 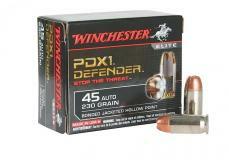 The Winchester Bonded PDX is offered in 9mm, 40 Smith & Wesson, 45 automatic and .38 special.